This bathroom defies expectations by placing the sink behind a divider wall that forms part of the shower. The fresh approach gives the space an "open plan" that mimics contemporary living trends, and it allows for one wall to act as open shelving that is within easy reach of the tub. Tesla® Collection fixtures by Delta Faucet, inspired by organic shapes found in nature, unify the three areas of the bathroom. 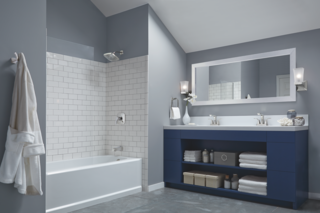 In color psychology, blue is said to lower the heart rate and slow respiration, which makes it a calming hue that is best suited for bedrooms and bathrooms. A cool palette of white, blue-gray, and navy blue makes for a classic look in the space above. 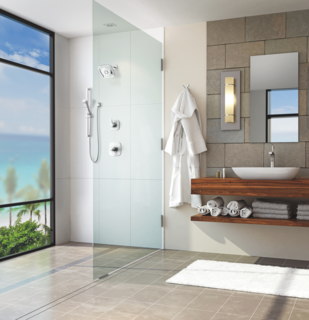 A frameless glass shower partition keeps the spray of water under control without adding bulk, making the bathroom seem larger and more open. Finding the right showerhead can work wonders in creating a spa environment at home. The Zura™ H2Okinetic® Pendant Raincan Showerhead by Delta Faucet sculpts the spray of water into an undulating pattern that provides a refreshing, immersive experience. The jewel-like fixture comes in four finishes—chrome, matte black, polished nickel, and stainless—to best complement the space. 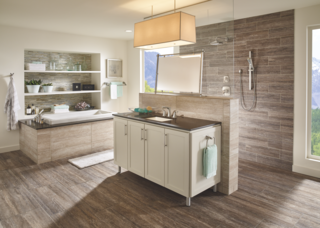 Floor-to-ceiling glass takes precedence in living areas, but bathrooms benefit from natural light as well. Paired with a deep soaking tub or a generous shower, a large window takes advantage of surrounding views, illuminates the room, and contributes to a spa-like experience. To preserve your privacy, consider using a pane of frosted glass that still allows you to feel connected with the outdoors. While wooden slats may not be practical for the whole bathroom, they add a warm, natural accent as flooring under a tub or in a shower, creating an ambiance that recalls a Japanese bath house. You’ll want to choose a rot-resistant wood like teak, ipe, or California redwood, and take the proper steps to seal it. In the minimalist bathroom above, a wood floor wraps up the wall and becomes a ledge to hold toiletries and other shower necessities. 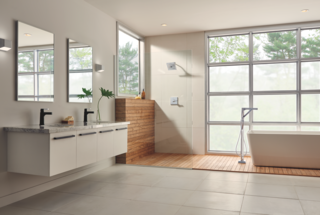 Open showers that ditch the curtain elevate the everyday experience, recreating the feeling of being outdoors and unencumbered. A lot of factors are at play here—to avoid soaking the bathroom, make sure to account for the splash zone, or install a glass partition. Choose a showerhead that directs the stream of water downward. In the marble-tiled oasis above, a Delta Faucet shower pairs with a Compel® Two-Handle Wall Mount Lavatory Faucet above the floating vanity for a clean, weightless look. The bathroom is where you can tile to your heart’s content, and the height of your tile wall will go a long way in determining the overall look of the space. Right at the halfway point, tile wainscoting is a healthy blend of form and function, protecting the lower walls from scuffs and stains while holding a classic appeal. Here, dark gray paint pairs handsomely with oversized subway tiles. Though it’s a nod to traditional styling, the clean border keeps it looking modern. 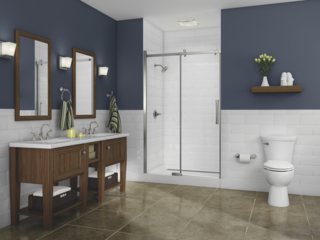 What are the best bathroom renovation ideas you've seen? Let us know in the comments below.